This morning’s sunrise featured more tangerine than rosy hues. Remember you can click on any photo to see a larger version. I know the folks in the Northeast are cold, snow-plagued, and miserable. I know the folks in the Pacific Northwest who prayed for rain for most of a decade are desperately looking for the emergency shut-off valve to Heaven. And I’m sorry for your troubles, truly I am, which is why I feel a tad guilty complaining about the temperatures dominating the southeastern Piedmont region of the US. Sure, it got down to 25 degrees Fahrenheit at my house this morning. I had to remove ice from the bird baths. But according to the forecasts, I probably won’t need to do that again for at least ten days. And the way things are going, maybe not until next November. My neck of the woods is hurtling full-tilt-willy-nilly into spring. Crocuses are nearly done now. 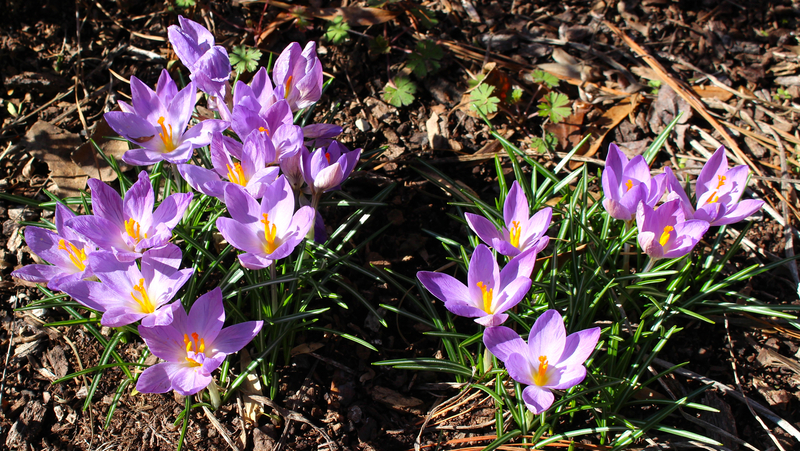 We’ve already zoomed through crocus season, the snowdrops opened yesterday and will likely be done in a few days. 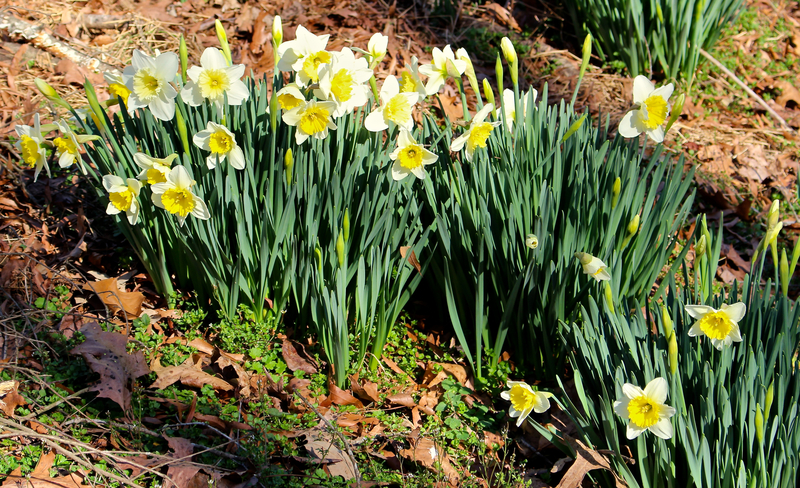 I planted a variety of daffodils that are supposed to provide me with an extended seasonal bloom period, but I’m starting to think that may not happen this year. I started seeds of greens for my spring garden during the first few days of February; at the time, I wondered if I was overeager. 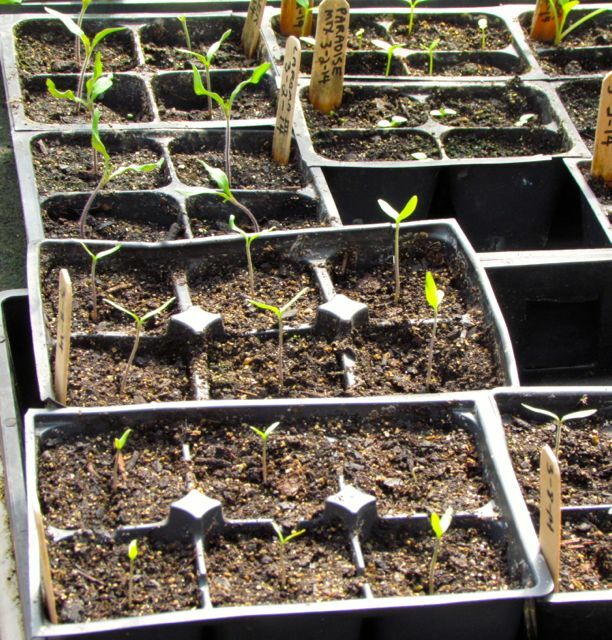 Now I’m exhorting the seedlings to grow faster, fearing that if I don’t get them transplanted into their garden bed soon, summer temperatures arriving by early April will melt them before we’ve harvested more than a salad’s worth. This. Is. Not. Good. I posted the above shot to my Facebook page the other day, and someone there asked me to list the varieties I’m growing, because she couldn’t read the scrawls on the labels in the photo. 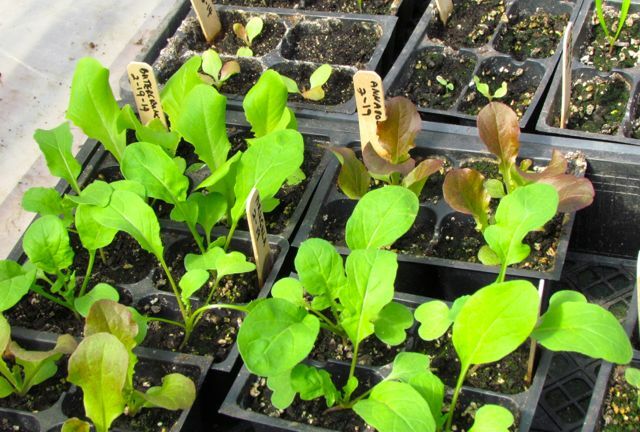 So for her — and anyone else who might be interested — here are the spring salad varieties growing in my greenhouse right now. Coastal Star — This is my go-to green romaine lettuce. It stands up to the early heat that hits my area in late April/early May. This is the third year I’m growing it. Outredgeous — I grew this red romaine for the first time last season, and we loved it. It faded in the heat a little faster, but it stayed alive and productive this whole past winter for me beneath a row cover. I love this lettuce. Cherokee — This is a red summer crisp lettuce that I’m trying for the first time, because Johnny’s Selected Seeds (the source of most of my veggie seeds) says it is more heat-tolerant (i.e., bolt-resistant) than most. Ovation Greens Mix — I’ve grown this mix several years now. 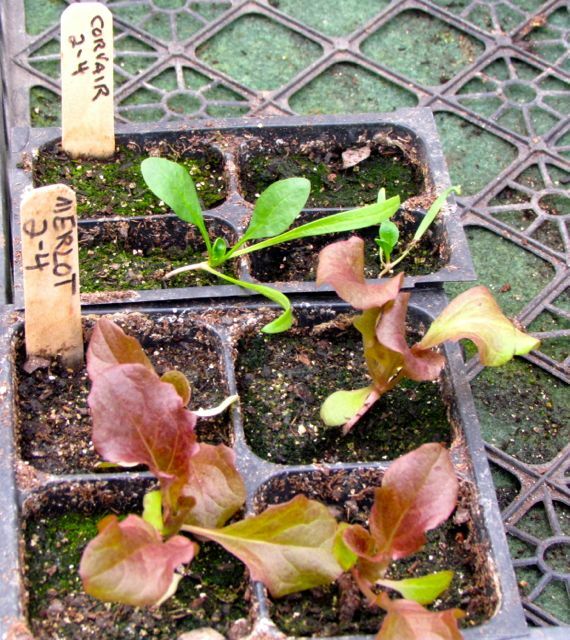 I get a nice assortment of fast-germinating speciality greens that give a nice tang or slightly bitter note to sweeter lettuces. They bolt very quickly in my heat. I direct-sow a few more when I transplant the starts in my greenhouse; sometimes that pays off, sometimes it doesn’t. Seaside Spinach — This is a new smooth-leaf variety I’m trying this year, because it is touted as being bolt-resistant. I often have trouble persuading spinach to germinate for me in the greenhouse, but this variety is popping up and growing with enthusiasm — a promising start. Rosaine — I grew this red bibb lettuce for the first time last year. It produces really lovely thick, buttery leaves. It is supposed to be bolt-resistant, but did not impress me last season. However, like Outredgeous, it produced all winter for me under a row cover. I’m thinking red lettuces may be more cold-tolerant. Corvair Spinach — If Seaside remains as enthusiastic as it is starting, I won’t be growing Corvair again. This smooth-leaf variety is a downright temperamental germinator for me — and most everything germinates for me, so this is unusual. The plants that do show up, grow well enough, but I would rather grow a spinach that I can always count on. Sparx — This is a new green romaine I decided to try, because it is supposed to be heat-tolerant and high-yielding. It is back-ordered until March 1. At the time I ordered, I figured this would not be a deal-breaker, timing-wise. The crazy weather may preclude a proper test of this variety, but I’ll give it a try when it shows up. That’s it for the greens. Believe it or not, I really tried to keep down the number of varieties I’m trying this year. I also tried to contain myself when it came to tomato varieties, but I compensated with a new pepper variety, and an eggplant that intrigued me. Seed catalogs in deep winter are very, very hard to resist. The absurd warmth caused my flowering apricots to zip through their bloom cycles much more quickly than usual. Only Peggy Clarke Senior is still perfuming the air, albeit faintly, with the magical cinnamon-sweet scent of her rosy blooms. These flowers on Royal Star were just beginning to open two days ago. 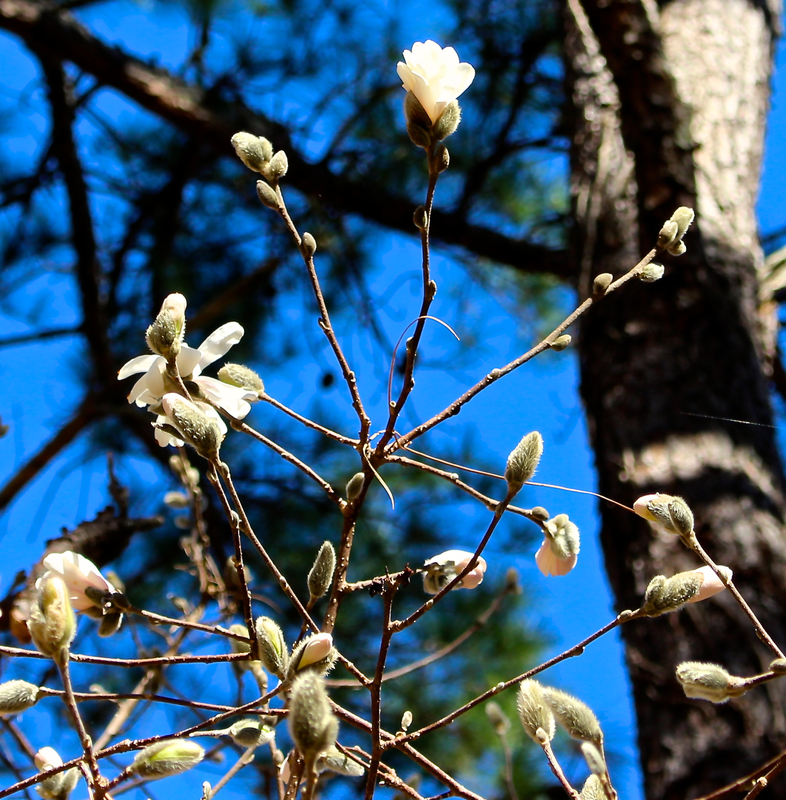 Our Magnolia stellata ‘Royal Stars’ has opened flowers at the top of the tree. The forecasted heat this weekend will no doubt cause most of the rest to explode into bloom. 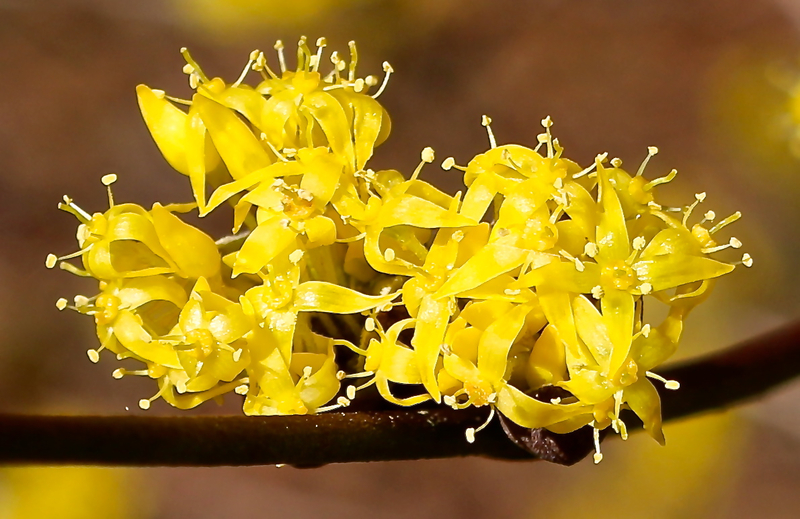 Both of my Cornelian cherries (Cornus mas) are in full bloom. I’m hoping the warmth will encourage pollinators to cross-pollinate them to produce fruits this year. This member of the dogwood family doesn’t naturally occur in North America, but it doesn’t seem to be invasive, so I decided to give it a try. If I start seeing seedlings popping up, I will yank it out pronto. Golden Ragwort makes a great ground cover for moist shade. My patch of Golden Ragwort grows larger every year. It does a great job of reducing erosion, and when it blooms, its bright yellow flowers make the ground glow. 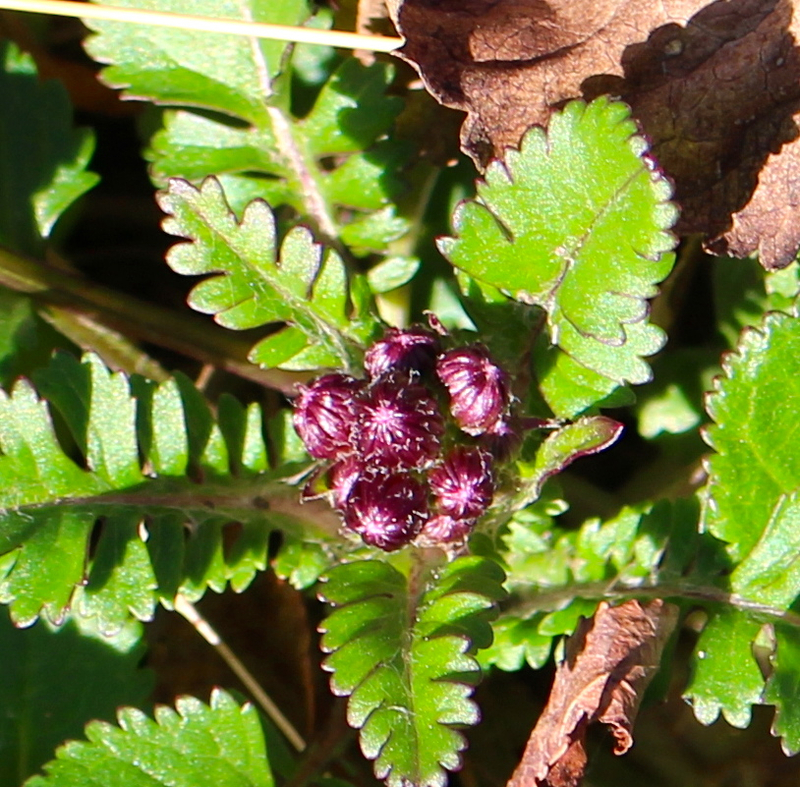 I love the magenta flower buds and stems of Golden Ragwort. The weekend is supposed to reach high temperatures in the mid-70s here, so Wonder Spouse and I will be outside preparing spring vegetable beds and hauling fallen branches knocked down by winter storm winds. I anticipate plenty of sore muscles and creaky joints. But it’s all worth it when we sit down to the first salad of the season. I’ll leave you with one last photo. I posted this to my Facebook page, but I wanted to share it here for my non-Facebook followers. 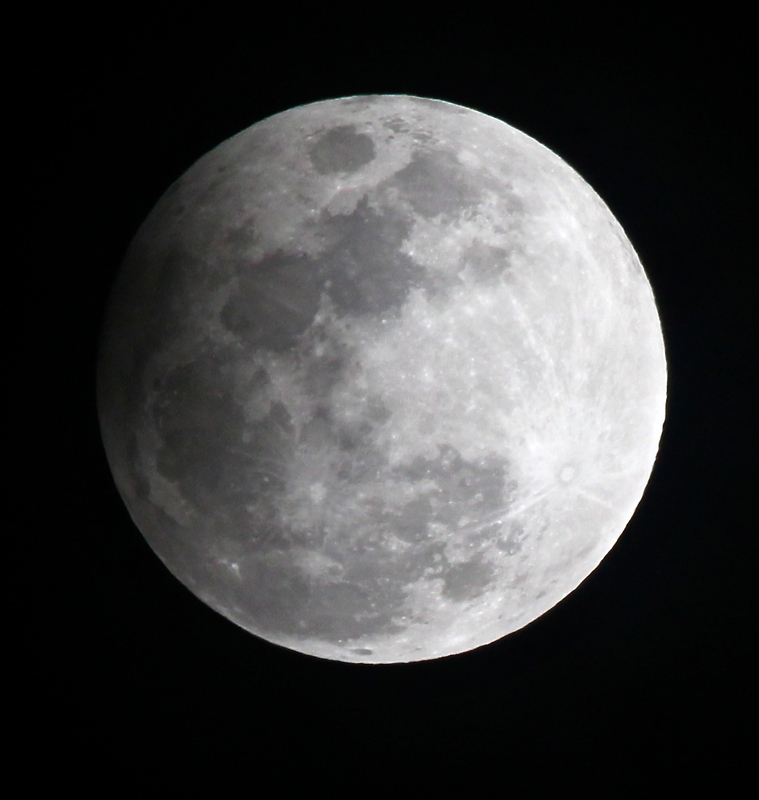 On February 10, we enjoyed a penumbral lunar eclipse. Just the left edge of the full moon in the photo below was obscured by the sun’s shadow, but it was discernible. The Amazing Wonder Spouse set up his tripod and took this shot. Enjoy! Sorry for the prolonged silence, folks. I’ve been too busy to write, thanks to a break in the weather. 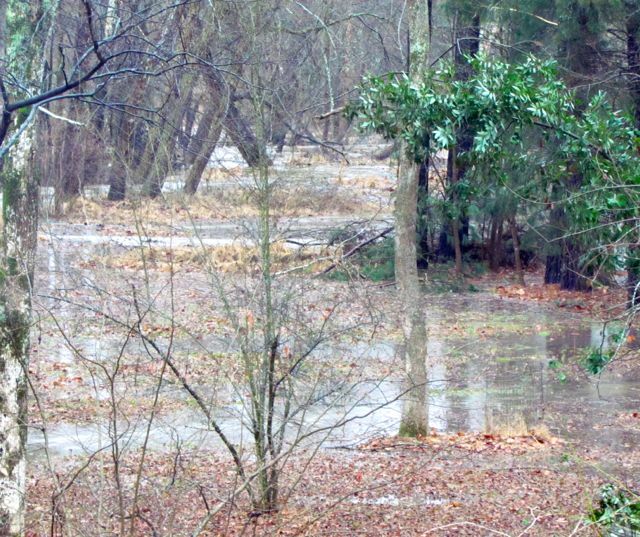 After the snow melted, we got 1.28 inches of rain, which caused my creek to flood. Although our vegetable garden is at the top of our hill, a good 200 yards or so up from that active floodplain, the raised beds were still unworkable for a while. I actually hit ice in the first one I tried to weed before the rain came! But my property is blessed with sandy loam instead of Carolina clay, so my raised vegetable beds became workable a few days ago, and just in time. My greenhouse was overflowing with eager spring lettuces, spinaches, and assorted other greens. This is the size they all were before transplanting. I ran out of bed before I ran out of greens, so these still linger in the greenhouse. I rid two vegetable beds of their winter weeds. 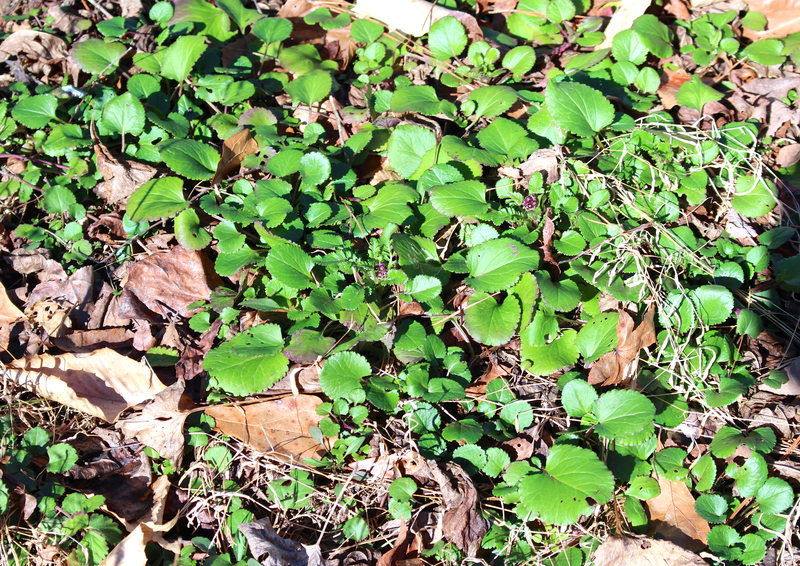 The crimson clover I had planted to prevent their takeover was killed by our super-cold February temperatures. But the henbit and chickweed thrived. At least they are relatively easy to remove. I was hoping to direct-sow some carrots, but they need a minimum soil temperature of 55 degrees, and as of yesterday afternoon, my soil temperature was 48 degrees. Maybe next week, if the clouds will part to allow the sun to warm the beds. One bed of transplanted, mulched, and watered greens. I know they don’t look like much, but that’s a lot of potential salad in that shot. I left a bare spot in the middle for a few carrots, when the soil temperatures allow. 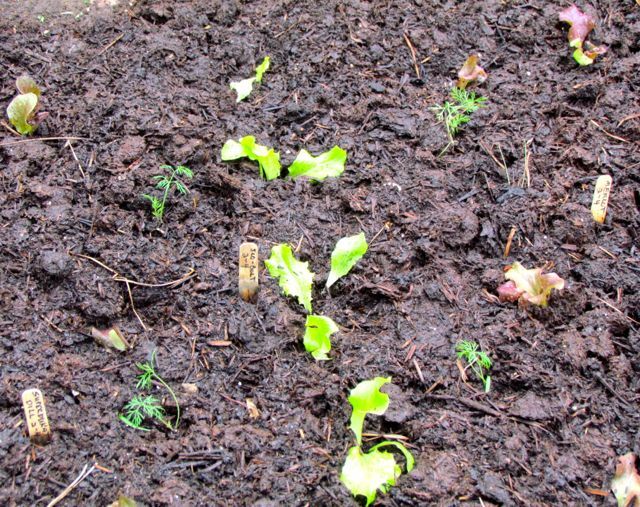 I mulched the new transplants with the last of the mushroom compost we had delivered last season. I finished off that pile, so we’ll be getting more delivered as soon as the weather allows. The kind folks at WordPress who created and maintain the blog software I use provide me with many useful statistics, including a daily list of search terms folks are using that lead them to my blog. From this, I know that a number of Piedmonters are starting to think about spring gardens and what they should plant. So I thought I’d share with you what I’m growing this year and why. First, gardening — especially vegetable gardening — is a trial-and-error endeavor. Even if you grow the same varieties every year, you won’t get the same results. Weather, diseases, insects, seed quality, pollinator availability, varmint invaders — these are just a few of the variables that make it impossible to be sure you’ll end up with what you envision. That being said, I’ll tell you what usually works for me. A close-up of just-transplanted greens. This assumes, by the way, that your garden area is already prepared and waiting. If you’re just now contemplating breaking ground for a spring garden, forget about it — unless you’re going with a container garden. 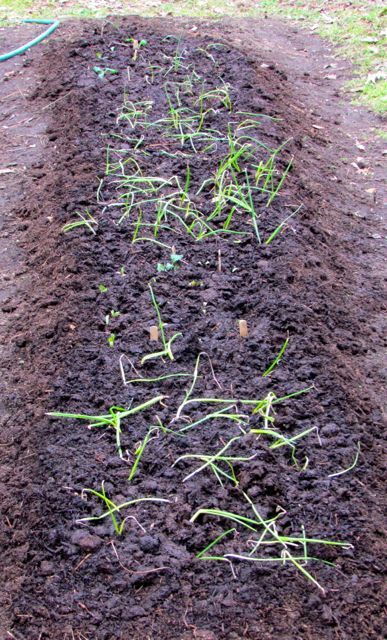 The soil is too wet, and you don’t have time to get it ready for a spring garden. If the soil dries out soon, you could still grow summer crops in new ground, but it will take some serious work on your part. I wrote about soil preparation here. I like to experiment, so most years I try at least a few varieties that I’ve never grown before. Sometimes the hype in the seed catalogs leads me astray, but sometimes I strike gold. That’s how I found Sweet Treats tomatoes — a cherry tomato variety I can’t live without now. In the spring garden, there’s really only one kind of onion variety that grows well in our area. Onions are tricky, because most are sensitive to the amount of daylight they receive. The only kind I find worth growing are Yellow Granex onions. These sweet onions remain reliably mild. Mine rarely obtain the enormous size of the ones I see in the grocery stores, probably because I never manage to give them as much water as they want. But we always end up with a nice crop of medium to small sweet onions that store very well in our cool basement. Spinaches come in two forms — smooth-leaved and savoyed-leaved. Savoyed-leaved varieties have wrinkly leaves. For me, the savoyed-leaf types seem to grow better, but if I plant early, I usually get at least some smooth-leaved leaves worth eating too. Spinach in my garden bolts at the first sign of heat. An 80-degree day is enough to get it to start sending up its seed stalk. When that happens, the leaves turn bitter and inedible very quickly. I always look for varieties that are described as “bolt-resistant” or “heat-tolerant.” Even so, the spinaches are done well before the lettuces every year in my garden. This year, I’m trying three different spinach varieties. Tyee is one I grow every year, because it always seems to be the last to bolt. It is a savoyed-leaf type. I’m trying another variety, Crocodile, of the same leaf type. This year, the smooth-leaved spinach I’m trying is Corvair. I purchased all three varieties from Johnny’s Selected Seeds. Annapolis — This is a red romaine that I grew last year and loved. I think it was the last lettuce to bolt last year. Coastal Star — This a green romaine that also holds up very well in the heat. 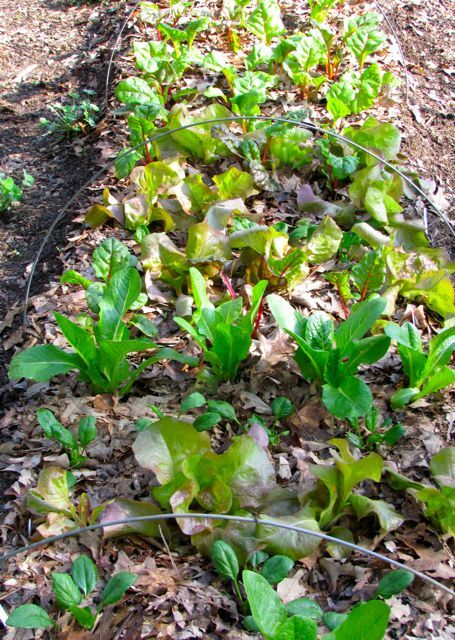 In the most recent growing years, the romaine lettuces have outlasted all other types. Merlot — a leaf lettuce reputed to be “the darkest red lettuce in existence.” Red lettuces, as with red/purple fruits, contain beneficial phytochemical nutrients. Baker’s claims it’s very bolt-resistant. Time will tell. Slo-Bolt — a green leaf lettuce with a name that tells you why I’m trying it. The Baker’s catalog claims it to be an excellent variety for the South. That’s me. I also love the bitter speciality greens so often featured in fancy salads these days. The arugulas, mustards, and assorted other brassica relatives are very quick to bolt in my spring garden. So I limited myself to one mix from Johnny’s called Ovation Greens. They did produce a nice mix, which I interplanted in the bed with the lettuces and spinaches. I also got a complimentary packet of Tuscan Baby Leaf Heirloom Italian Kale from Renee’s Garden. 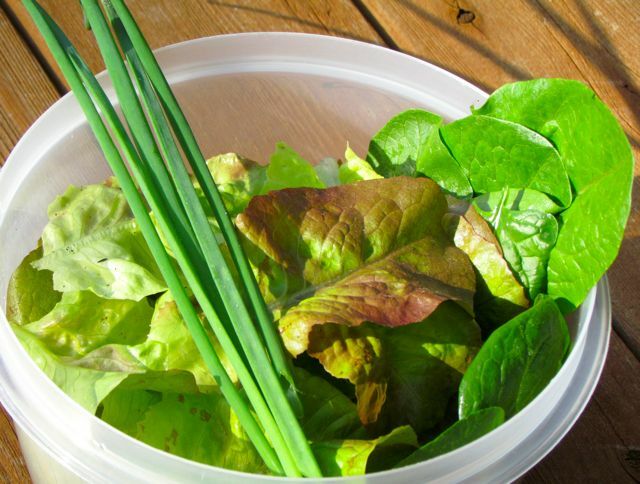 The packet says it is a fast-growing variety designed to be picked small for salads. Free seeds for salads? You know I had to try it. I suspect it will bolt quickly; I’ll keep you apprised. I started a few dill plants in the greenhouse when I planted the greens. Like the greens, dill bolts in the heat, and I wanted to try to give some an earlier start than I can provide with direct sowing (that soil temperature thing again). Interplanted with the greens are a few, slightly spindly Superdukat Dill plants from Johnny’s. This variety is supposed to produce more leaves than flowers, and it is the leaves we use in cooking. I’m hoping the plants will look more lively after they adjust to their new surroundings. Interplanted with the onions are a few Red Ace beets that I started in the greenhouse. They germinated quite well for me. I’m hoping that I’ll get bigger beets by having plants in the ground this early. Cloudy skies and a week of predicted above-freezing temperatures provide optimal transplanting conditions. I am absolutely gambling on the weather by transplanting now. I plan to cover the greens bed in a tent of heavy-weight garden fabric to protect them from freezes. But I won’t be able to get to that for a few days. If the temperatures dive more than predicted, I could be in trouble. But the prospect of an early, prolonged salad season was too tempting to ignore. 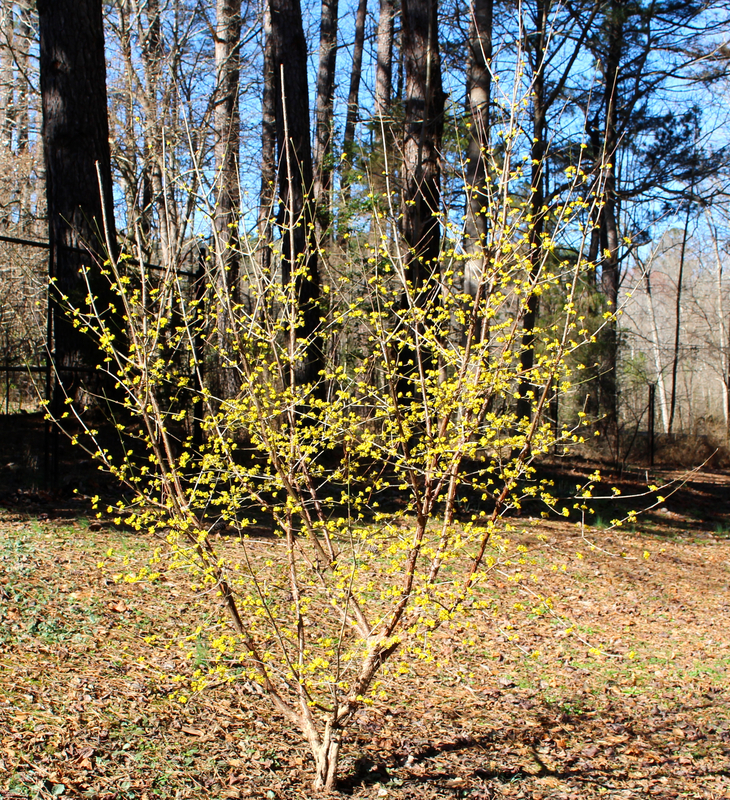 After I finished planting yesterday and took pictures of the results, I walked around the yard to document some of the early-blooming trees and shrubs beginning to explode with color. I’ll share some of those shots soon. 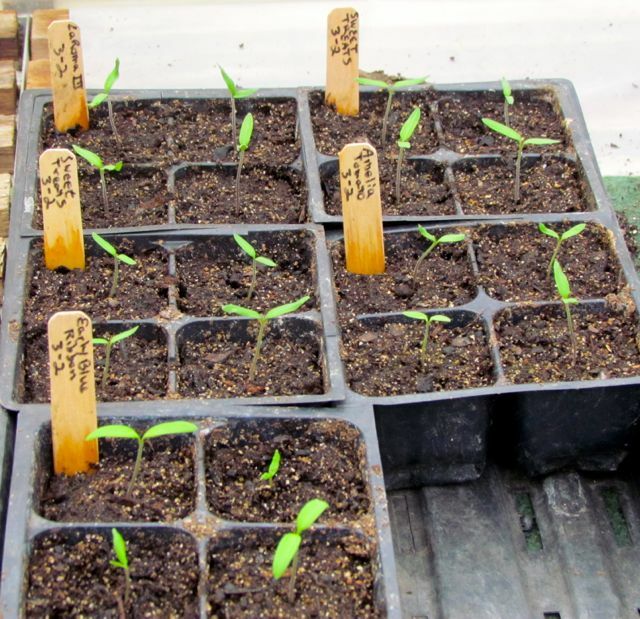 For those of you wondering about summer garden plants, if you’re growing from seed, you should not wait any longer to start your tomatoes and peppers. I’ll share my progress with those veggies soon too. So much to do and show and tell. Surely, it must be almost Spring! Tomato seedlings in my greenhouse. 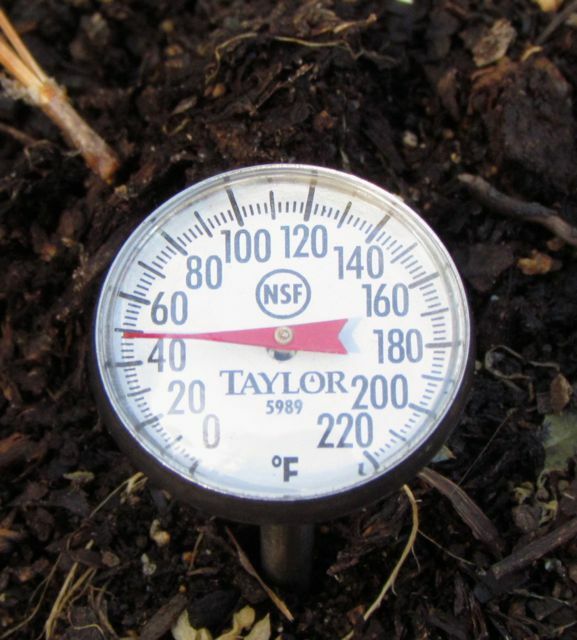 If the soil temperature is too cold, forget about it. Some decades back, I remember an experienced gardener telling me that it’s time to plant corn when emerging oak leaves are the size of squirrels’ ears. Being of a more scientific bent, I did a bit of research and discovered that corn likes a minimum soil temperature of 50 degrees Fahrenheit. 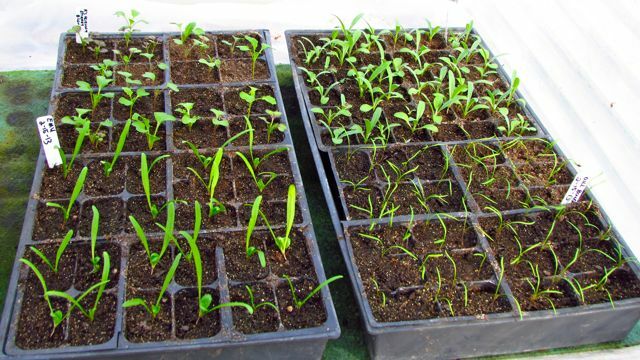 I’ve since found that corn germinates better for me when the soil is closer to 60 degrees. But there’s truth to that old gardener’s advice. Over the years, I have observed that my soil temperatures reach 55-60 degrees just about the time the leaves of my tall oaks reach the size of squirrels’ ears. It varies a bit, depending on which species of oak and whether the oak is growing anywhere near the garden plot, but, in truth, oak leaf size and soil temperatures do seem to reliably correlate, proving once again that a gardener always fares better when she pays attention to the environmental cues surrounding her. 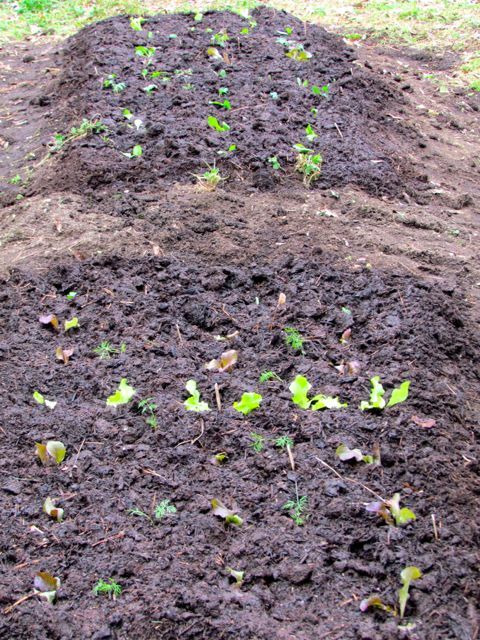 Especially in late winter/early spring (I can’t tell them apart this year), soil temperatures are critical to the success of my spring vegetable garden. Spring vegetables have a lot going against them in my region most years. Winters are often very wet, making for soils too wet to work. Or, like this year, repeated blasts of icy precipitation keep the soil not only too wet, but also too cold for planting. The sun is supposed to return with warmer temperatures just in time for tomorrow’s vernal equinox, and I know I speak for all frustrated southeastern gardeners when I say, Hallelujah! But that’s the other tricky part of southeastern springs. Most years, they don’t last very long, instead morphing into summer by late April. Spring vegetables dislike summer heat as much as they are averse to freezing rain. It’s a flat-out gamble whether I reap much edible at all most years. But to be without the crisp freshness of just-picked greens or carrots, or the earthy sweetness of a red beet or onion — that’s too cruel a fate for my winter-worn green-craving palate to contemplate. And so I gamble/plant. Eager greens ready for transplanting. The local agricultural college near me publishes all kinds of useful information about gardening, including this handy chart of vegetable varieties and the minimum soil temperatures required for germination. From it, I see that lettuce and spinach seeds need 45 degrees. If you look at the top photo in this post, you’ll see that the soil temperature in my future lettuce bed was hovering at around 50 degrees last Friday. The ice storm of yesterday may have dropped it a bit, but for transplants, I’m not worried. In a couple of weeks, I’ll direct-sow additional seeds into this bed for what I hope will be a more prolonged harvest — if summer temperatures delay their arrival long enough. Red Cross — A heat-tolerant butter head lettuce that produced spectacularly for me last year. It was also delicious and really handled the heat well. As the name hints, its leaves are a beautiful red, which I love. Buttercrunch — Really tasty and sweet, and reasonably slow to bolt. 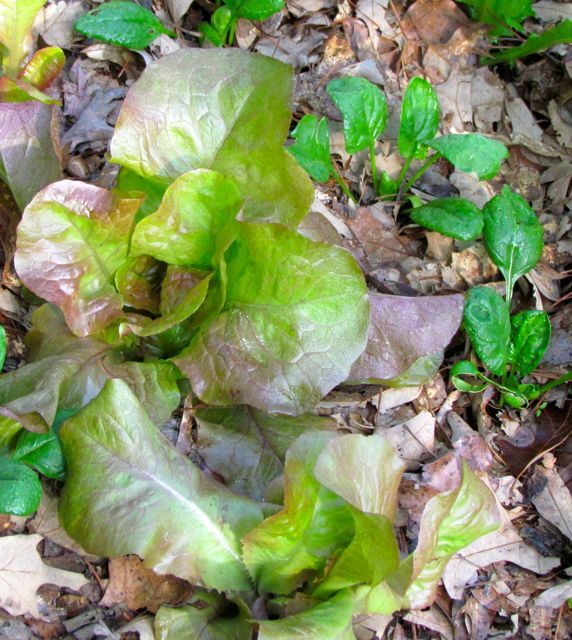 Leaves have enough body to work well as lettuce wraps, but are tender and sweet enough to eat by themselves. Yes, I’ve grown it before. Annapolis — This is new for me this year. I couldn’t resist the description of what is supposed to be their darkest red romaine lettuce. Who doesn’t love romaine lettuce? Coastal Star — Another romaine, one I’ve grown several times now because it is reliable and wonderful. Sweet, dark green leaves that stand up to warming springs better than I could have ever hoped. I love this lettuce! Corvair — Spinach comes in two forms. Some are smooth-leaved, and Corvair is one of those. This is a new variety for me. It is purported to be a slow-bolter and resistant to mildews. Less wrinkled spinach leaves means less washing required, so I’m giving this one a try. Tyee — This is a savoy spinach — the wrinkled-leaf kind. I’ve grown it for years because it is tasty and vigorous. Its rapid leaf production compensates for its tendency to bolt when temperatures begin to warm. Arugula — The standard salad arugula. I’ve grown all sorts of mesclun greens in past years, including this arugula. They all bolt at the first hint of 80 degrees. Despite my fondness for these tangy greens in my spring salads, I confined myself to just this type this year. I’ve composted way too many bolted mesclun greens in past seasons. This year, the arugula will have to suffice to provide that contrasting zing to the sweetness of the lettuces and spinaches in my salads. Earlier this week, my onion plants arrived. The Yellow Granex plants will get tucked in at the same time I transplant the greens. Again, I would have popped them in before now, but all was ice again just yesterday. Romance — This is a new carrot variety for me, advertised as delicious, high-yielding, and uniform. I couldn’t resist. Nelson — This consistently sweet early carrot (Romance should mature later) is a reliable old friend in my garden. Red Ace — I’ve tried other beet varieties, but this is the one we love. Always productive, magnificently sweet and tender. We love these beets! That’s it for the spring garden. If I see any healthy broccoli plants at the local agricultural supply store, I may grab a few, per Wonder Spouse’s request. I rarely have great success with spring broccoli — that summer heat problem again. But it will be easy to add a few beneath the tented lettuce bed, where cabbage moths can’t reach them to deposit eggs. I’ve also given up on spring peas. They are so very heat sensitive, and our winters are so up and down that I rarely get a crop worth my effort. If we have a craving for spring peas, we can always grab a few at the local farmers’ market. The greenhouse is getting full of seedlings. All my tomatoes and peppers are well up, but still small, of course. I’ll tell you about them another time. I’ve got lots of flower seedlings growing too. Some kinds take almost two months to reach transplanting size, so I must start them early. Wonder Spouse will be creating his potato bags this weekend. He would have planted them sooner, but that pesky ice slowed him too. Every year, my blog view count increases as people search on things like, “When can I plant spring vegetables?” You will find charts of average last frost and freeze dates, but I consider those rough ballpark estimates. Every yard is different, thanks to variations in microclimate. The best way to know when to plant your spring vegetables is to pay attention to what your garden area looks like during late frosts. Is it snowy white? Then you’re in a cold spot. Err on the later side of the planting range. 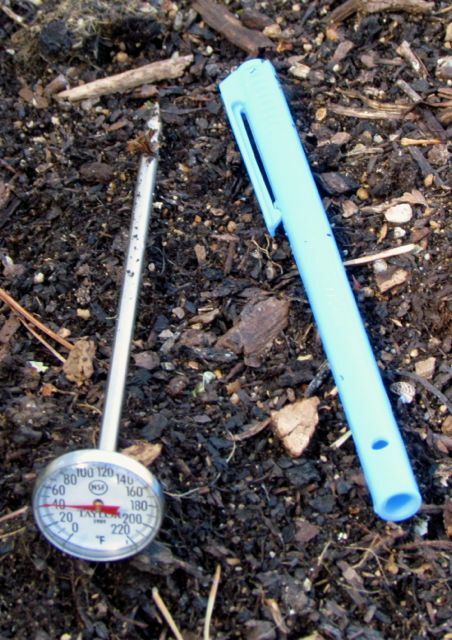 To be much more confident, invest in a soil thermometer and use it. They are not expensive. Mine even comes with its own little case with a clip for attaching it securely to a pocket. Every gardener needs one of these. I know that the wildlife in my yard is even more ready for spring than I am. 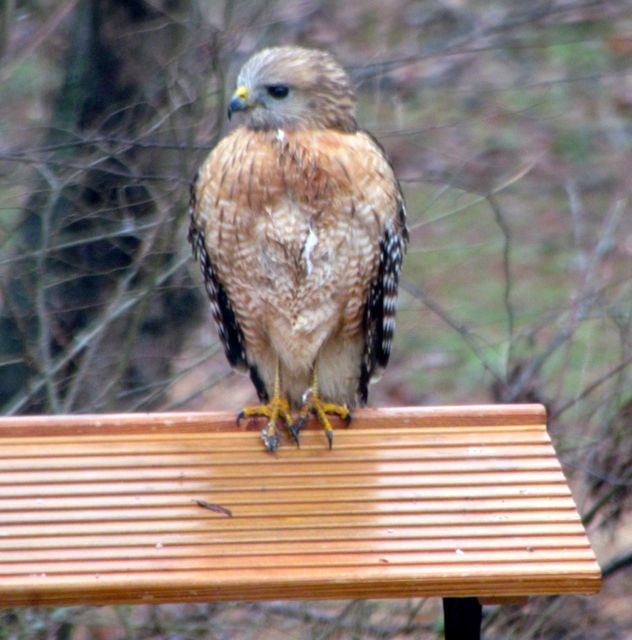 Two days ago, as a cold rain began morphing into freezing rain, a frustrated Red-shouldered hawk actually parked itself on top of my bird feeder for about ten minutes. It looked so hungry and frustrated that if I had had something to feed it, I would have tried. Hold on, Hawk. Spring arrives tomorrow! We’ll make it, friends. Spring is tantalizingly close now! Charge of the Lettuce Brigade! Can you feel it? The Spring Peepers can; they sing in my swamp with more vigor every day and night. Even the House Finches are feeling it. One came to the bird bath on my deck this afternoon with his mouth full of nesting material. He dropped the bundle of grasses beside his feet to drink, but the strong March winds blew it away before he’d taken a sip. I don’t think he was really ready to build a serious nest anyway. Perhaps the imminent Vernal Equinox (March 20) has him a bit addled. I’ve been waiting for below-normal temperatures to abate so that I can start preparing my spring vegetable beds. It looks like this weekend will finally bring proper preparation conditions — and the amazing Wonder Spouse has even agreed to lend a hand. The timing is good. 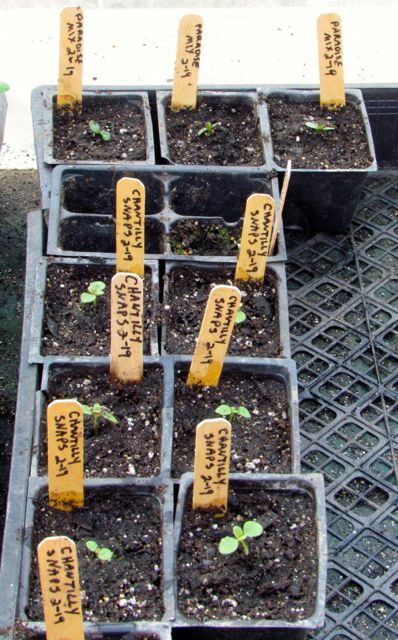 The seven kinds of greens growing in the greenhouse will be transplanting size very soon. And I need the room — it’s nearly time to start sowing tomato and pepper seeds. I did not originally intend to grow seven kinds of greens this year. I had settled on five from my favorite seed supplier — Johnny’s Selected Seeds. But then I got my complimentary seed order form from Renee’s Garden (courtesy of my membership in the Garden Writers Association), and temptation overcame me. The first five are from Johnny’s, Summer Perfection is from Renee’s, and the final Asian greens mix was a freebie seed package from some other supplier, whose name I’ve managed to lose track of. Also currently growing are seedlings of Bouquet Dill from Johnny’s and Blue Boy Cornflowers from Renee’s. Ideally, dill is best direct-sowed, but unpredictable weather — mostly in the form of hard rains — usually gives me sparse results when I direct-sow. As long as I transplant these herbs while they’re small, their somewhat temperamental tap roots should adjust without difficulty. One can never have too much dill, in this gardener’s opinion. The Cornflowers are gorgeous blue annuals that bloom early, laughing at late frosts. I love the intense blueness of the flowers, so when I saw Renee was offering some, I jumped at the chance. 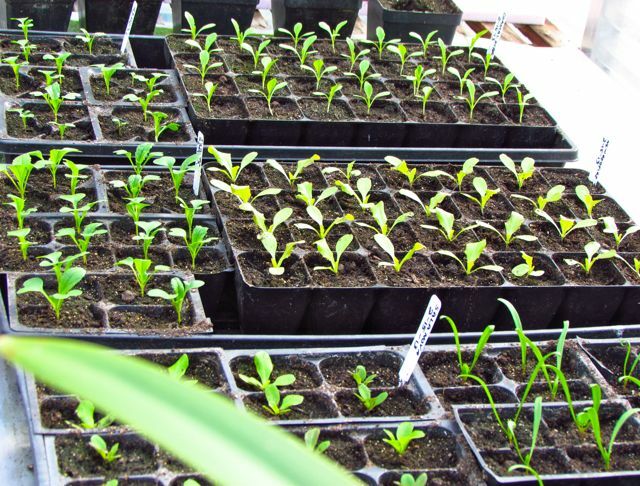 Because these are early spring plants, I didn’t use my germination chamber with the propagation mat to warm them. They don’t need the help. Even my cool greenhouse (I set the heater to come on at 45 degrees Fahrenheit) didn’t slow them down. All but the dill germinated in under five days. The dill took seven. 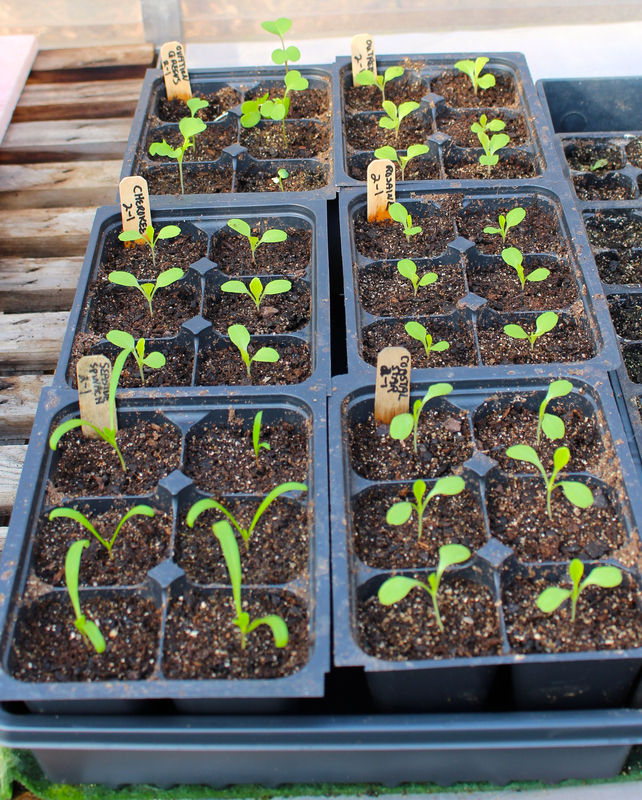 The cornflowers won the contest, sprouting in less than 24 hours — now that’s enthusiasm! Dill seedlings in the right foreground, cornflowers in the right background, spinach front left, Asian greens mix left back. When the garden beds are ready (i.e., weed-free), I’ll tuck in the greens, mulch with some fibrous compost mix I picked up from a local supplier, and enclose them in garden cloth supported by wire hoops. The cloth will protect the greens from all but the hardest of late freezes, and will also discourage rodents, who have learned to slip through my fence and help themselves — either field rats or meadow voles — or both. The last three are more freebies from Renee’s Garden that sounded too good not to try. Those carrots aren’t pelleted, so I’ll have some side-by-side data for comparison. The only other spring crop this year will be Wonder Spouse’s potatoes. The order is due to arrive next week. I’ll keep you posted on that experiment, which I mentioned previously here. I’ve given up on peas, either English or Sugar Snap varieties. Weather patterns have grown too unreliable for them, no matter how early I get them in the ground. Early heat waves destroy pod production just as flowering grows enthusiastic. Early heat is the main enemy in a North Carolina Piedmont spring garden. Most of the greens I picked were chosen specifically because of their purported resistance to early summer heat. Carrots and beets are less affected — unless the heat leaps in the 90s in April — and heaven help us all if that happens! Even after the spring garden is planted, there will be no time to rest. The summer beds will need to be prepared to receive the tomatoes and peppers that I haven’t even started yet (another week or two). As soon as the ground is warm enough, I’ll direct-sow the beans. I’ll start the squash seeds after the tomatoes and peppers are well germinated. They need less time to reach transplanting size. So much to do, and an aging body to do it with. But Wonder Spouse and I will persevere, knowing that the rewards are delicious and good for us too. But first, all those vigorous winter weeds must be removed from the planting beds. Charge! 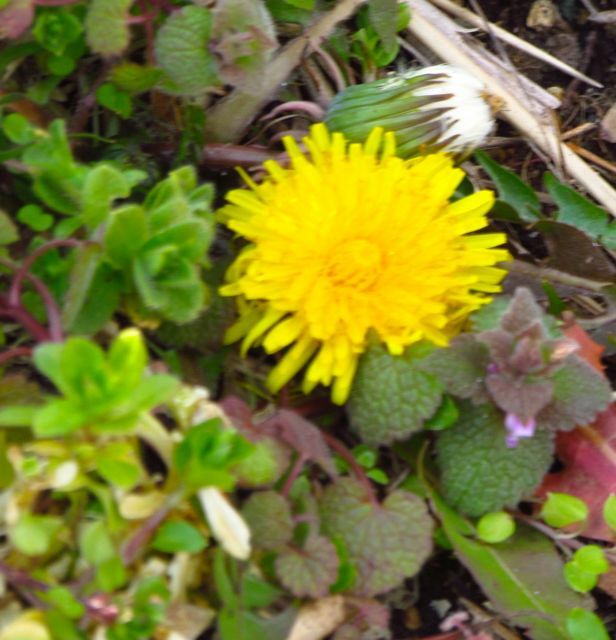 Winter weeds have responded with frightening enthusiasm to recent rains. I invited a friend over for lunch today and decided that a spring salad would be ideal fare. I bought some greens from the grocery, intending to supplement them with a few from my garden. However, when I visited my veggies this morning, I discovered I had more than enough to create two lovely salads built from my fresh greens alone. That’s the large plastic bowl that I used to hold my green treasures. Red Cross is a red butterhead lettuce variety. Isn’t it gorgeous? I love red lettuces; I swear they taste better than green ones. Although, I must say that the Coastal Star leaves we ate were also magnificent. Coastal Star is a green romaine lettuce. The dark green leaves in the above photo belong to Emu spinach, a smooth leaf type. I bought seeds of all three varieties from Johnny’s Selected Seeds — my source for most of my veggie seeds. These two lettuces are supposed to have better heat resistance than most varieties. I’ll let you know when they begin to bolt and go bitter on me. For sure, they are perfect now. You may recall that I started the greens in this bed in my greenhouse over a month ago and transplanted them about two weeks ago. I pronounce this process a success. Never have I harvested salad-worthy greens this early. All I had to do was wash off the record pollen deluge before serving them. Yes, the yellow haze of pine pollen dominates the landscape. 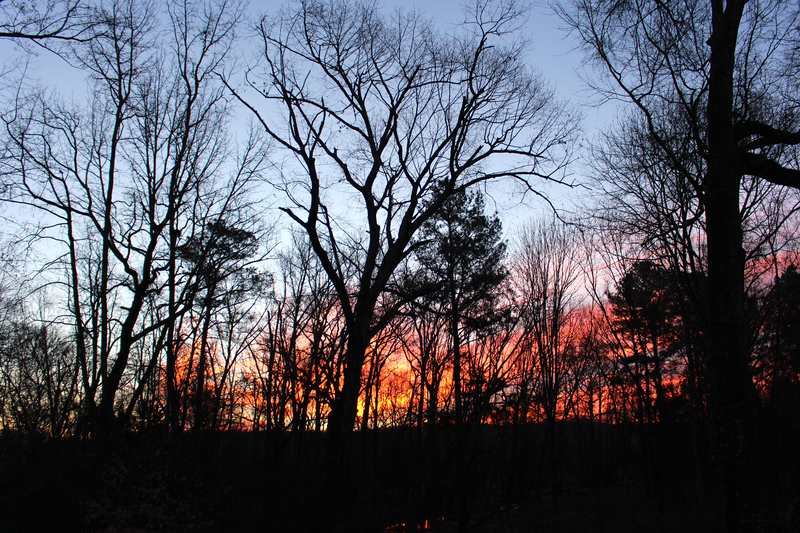 Every breeze releases yellow clouds from tall Loblolly Pines. Although pine pollen is too large to exacerbate allergies, it is still uncomfortable crunching under eyelids and sneaking into nasal passages. And its arrival is two or three weeks ahead of schedule, thanks to the continuing record warmth. 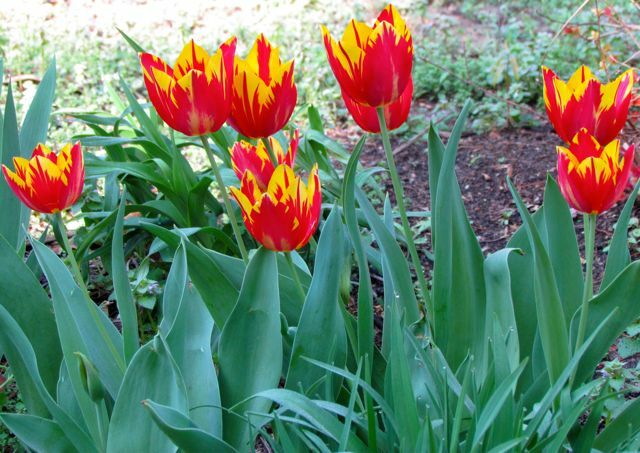 Spring flowers are undeterred by the trees’ reproductive enthusiasm, as evidenced by this lovely group of tulips. I lost track of the variety name years ago. Unlike most tulips, these have returned and bloomed many years now. I think they set their little corner of my front garden on fire. Happy Spring, everyone. Here’s hoping significant rains settle the yellow plague of pollen for all of us soon!